The article titled An Invitation to The Secret Doctrine gives an introduction and comprehensive overview of “The Secret Doctrine,” H.P. Blavatsky’s master work which is the Book of Theosophy. The articles Golden Keys to The Secret Doctrine and Human Evolution in The Secret Doctrine may also be found useful, along with other explanatory articles listed on the Articles page, such as Theosophy: The Ancient Wisdom. H.P. 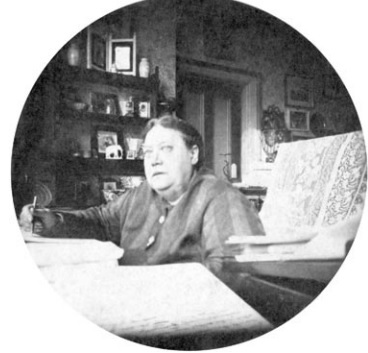 Blavatsky writing “The Secret Doctrine” in London. There are three main Mahatma Letters regarding the authorship of “The Secret Doctrine” and also a fourth, albeit largely unknown, in which it’s briefly mentioned. 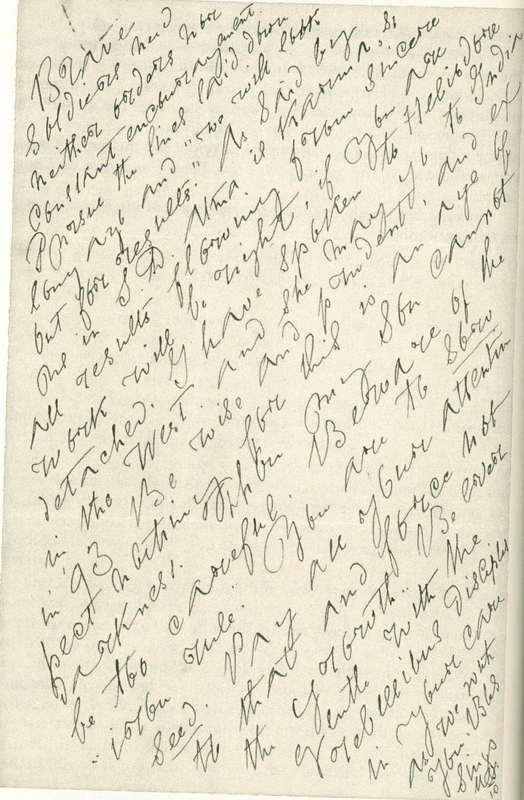 This other photograph is of a letter sent by the Master M. to William Judge in either 1892 or early 1893 and includes the phrase “As said by me in S.D.” – again indicating his direct role in the authorship of that book. 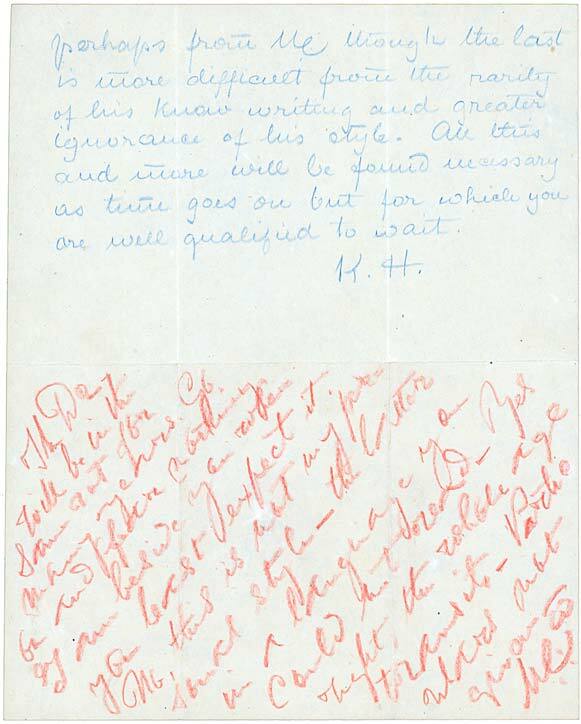 This letter is from after HPB had passed away, which was in 1891, but there’s no information or record available of how Judge received the letter, i.e. whether it was through the post or whether it materialised in his room or was transmitted through another person. “Heliodore” referred to in the letter is a name that was given to Annie Besant, who at the time of this letter was still on the right path. She did indeed end up going to India for the first time in 1893, as the letter predicted, and there fell under the influence of orthodox Brahmins who had always been opposed to HPB and the Theosophical Movement and who took advantage of her innate pride and vanity, particularly through G.N. Chakravarti. We need not go into this matter here but it is dealt with more thoroughly in other articles such as Col. Olcott’s Disloyalty to H.P. Blavatsky, William Q. Judge’s “New Era of Western Occultism” and The Final Mahatma Letter. “There was one occurrence which impressed me very strongly with the conviction that she was watched and cared for by unseen guardians. It was continuously repeated over a long period. 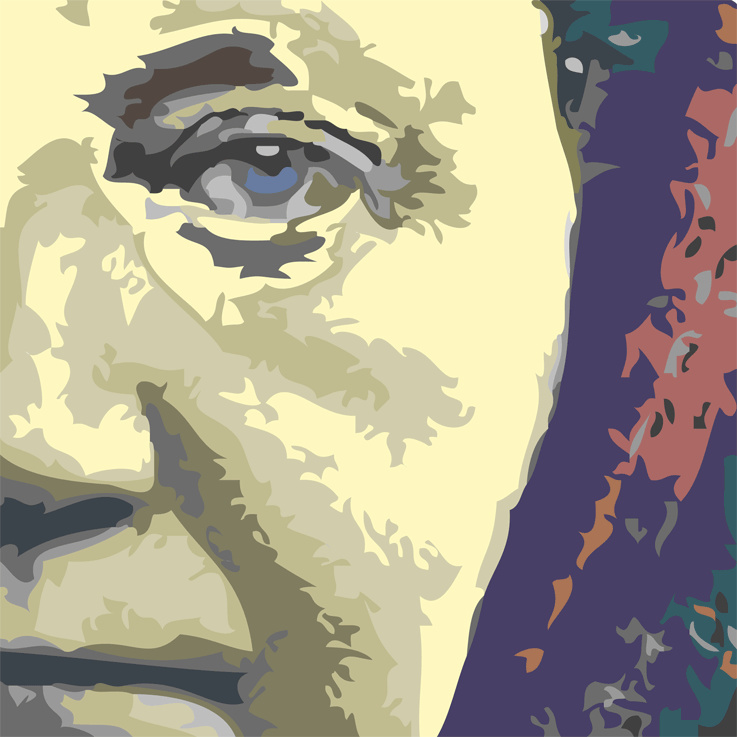 From the first night that I passed in her room, until the eve of our departure from Wurzburg, I heard a regularly intermittent series of raps on the table by her bedside. They would begin at ten o’clock each evening, and would continue, at intervals of ten minutes, until six o’clock in the morning. They were sharp, clear raps, such as I never heard at any other time. Sometimes I held my watch in my hand for an hour at a stretch, and always at ten-minute intervals the rap would resume with the utmost regularity. Whether HPB was awake or asleep mattered nothing to the occurrence of the phenomenon, nor to its uniformity. “One night this lamp was burning after the clock had struck one. I could not sleep, and, as I judged by HPB’s regular breathing that she was asleep, I rose, gently walked round to the lamp, and turned it out. … I had extinguished the lamp, and was going back, when it flamed up again, and the room was brightly illuminated. I thought to myself – what a strange lamp, I suppose the spring does not act, so I put my hand again on the spring, and watched until every vestige of flame was extinct, and, even then, held down the spring for a minute. Then I released it and stood for a moment longer watching, when, to my surprise, the flame reappeared and the lamp was burning brightly as ever. “This puzzled me considerably, and I determined to stand there by that lamp and put it out all through the night, if necessary, until I discovered the why and wherefore of its eccentricities. For the third time I pressed the spring and turned it down until the lamp was quite out, and then released it, watching eagerly to see what would take place. For the third time the lamp burned up, and this time I saw a brown hand slowly and gently turning the knob of the lamp. Familiar as I was with the action of astral forces and astral entities on the physical plane, I had no difficulty in coming to the conclusion that it was the hand of a chela, and, surmising that there was some reason why the lamp should remain alight, I returned to my couch. But a spirit of perversity and curiosity dwelt within me that night. 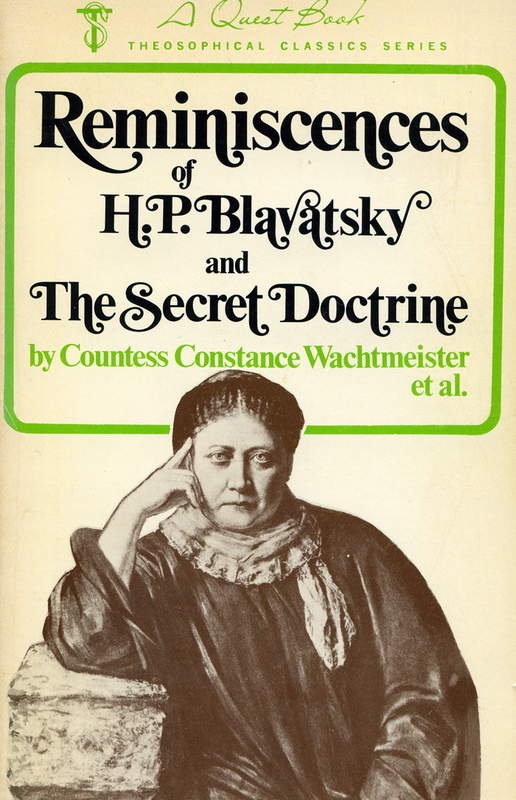 I wanted to know more, so I called out, ‘Madame Blavatsky!’ then, louder, ‘Madame Blavatsky!’ and again ‘Madame Blavatsky!’ Suddenly I heard an answering cry – ‘Oh, my heart! my heart! Countess, you have nearly killed me;’ and then again, ‘My heart! my heart!’ I flew to HPB’s bedside. ‘I was with Master,’ she murmured, ‘why did you call me back?’ I was thoroughly alarmed, for her heart fluttered under my hand with wild palpitation. “Speaking to those who know and believe that HPB was all the time in communication with the Masters in their retreats somewhere on the globe, I can say that a series of consultations was held among them as to what should go into The Secret Doctrine, and that it was plainly said that the book was to be done in such a manner as to compel the earnest student to dig out many profound truths which in a modern book would be announced specifically, and included in the regular course. It was also said, from the same source, that this age, being a transition one in all respects, that full revelations were not for this generation. But enough was to be given out in the manner described, and plainly, to make it substantially a revelation. All students, then, who are in earnest will do well not to pass carelessly over the pages of any part of the book. “The Secret Doctrine” must stand or fall on its own inherent merit, legitimacy, value, and worth – or lack of it, if the reader perceives it in that way. SOME RELATED ARTICLES: An Invitation to The Secret Doctrine, Golden Keys to The Secret Doctrine, Human Evolution in The Secret Doctrine, The “Third Volume” of The Secret Doctrine, Theosophy: The Ancient Wisdom, 12 Things Theosophy Teaches, Words from The Masters about H.P. Blavatsky, The Masters and Madame Blavatsky, Who are you, Madame Blavatsky?, Responding to Lies about H.P. Blavatsky, Praise for H.P. Blavatsky and Theosophy, Gandhi on Blavatsky and Theosophy, Who was William Quan Judge?, The Welcome Influence of William Q. Judge, Damodar and the Hall of Initiation, To those Theosophists who distrust “The Mahatma Letters”, The Unavoidable Facts about C.W. Leadbeater, 14 Good Reasons to reject the Alice Bailey Teachings, and How to successfully study the Teachings of H.P. Blavatsky. Found this on FB. Very interesting.